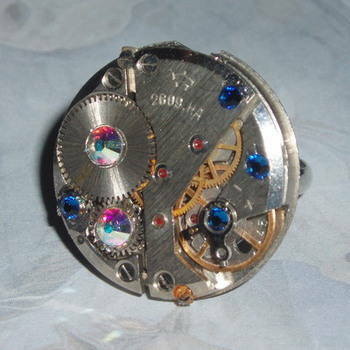 Made with a 25mm wide recycled vintage Watch Movement and AB and coloured Swarovski crystals. Watch movement is securely attached to a silver plated ring base. All the workings of the watch, including cogs, springs, jewels and balance wheels can be clearly seen. Absolutely amazing. This ring would make the perfect gift for any Steampunk fan. Very quirky indeed. Also great for a watch collector or a gadget lover. Every ring will be similar to the one in the photo but not always identical. Please allow 5 working days for dispatch as each ring is handmade to order.